"While I had imagined what the images would look like for years, nothing prepared me for the incredible detail we could see on that first scan," said Cherry, distinguished professor in the UC Davis Department of Biomedical Engineering. "While there is still a lot of careful analysis to do, I think we already know that EXPLORER is delivering roughly what we had promised. "The level of detail was astonishing, especially once we got the reconstruction method a bit more optimized," he said. "We could see features that you just don't see on regular PET scans. And the dynamic sequence showing the radiotracer moving around the body in three dimensions over time was, frankly, mind-blowing. There is no other device that can obtain data like this in humans, so this is truly novel." Cherry said he expects EXPLORER will have a profound impact on clinical research and patient care because it produces higher-quality diagnostic PET scans than have ever been possible. EXPLORER also scans up to 40 times faster than current PET scans and can produce a diagnostic scan of the whole body in as little as 20-30 seconds. 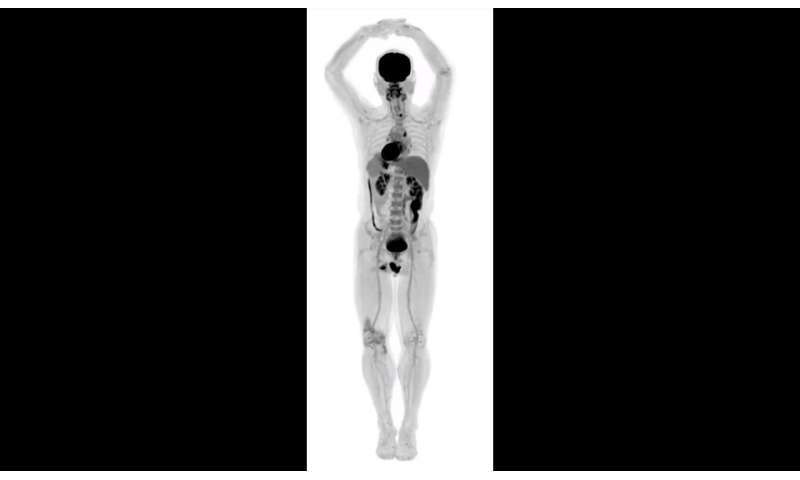 Movie tracing the delivery and distribution of a radiolabeled sugar (fluorodeoxyglucose) following injection into a leg vein, captured in real time by the EXPLORER scanner. In the first few seconds following injection it travels to the heart from where it is distributed through the arteries to all the organs of the body. At around 3 minutes, some of the substance is excreted from the kidneys into the bladder. Gradual accumulation of the glucose can be seen in the heart, brain and liver over time. The EXPLORER scanner will allow the delivery, metabolism and excretion of many substances and drugs to be followed in the entire human body in a similar manner. Credit: UC Davis and Zhongshan Hospital, Shanghai. "The tradeoff between image quality, acquisition time and injected radiation dose will vary for different applications, but in all cases, we can scan better, faster or with less radiation dose, or some combination of these," Cherry said. "I don't think it will be long before we see at a number of EXPLORER systems around the world," Cherry said. "But that depends on demonstrating the benefits of the system, both clinically and for research. Now, our focus turns to planning the studies that will demonstrate how EXPLORER will benefit our patients and contribute to our knowledge of the whole human body in health and disease."